For ages, people have been bartering to meet their needs and wants. Teaching kids about bartering helps them understand how individuals got by before systems of currency existed and shows them that money is not always required to get what you need. Lessons about bartering should involve a lot of examples and hands-on practice so your students truly understand the concept. Help your children understand bartering by giving them a chance to barter themselves. As they complete activities and play games, they will learn the basic concept of bartering, and it may spur them to try some real-life bartering. What Can I Do to Get What I Want? Have your child create a list of skills that she has and another list of things that she needs and wants. Look at the two lists together and have your child figure out how she can use at least one of her skills to get something on her lists of needs and wants. For example, if she wants a toy that her older sister has, she could do one of her sister's chores for a while in exchange for the toy. If she is having trouble in school, she could help a teacher clean up her classroom or file papers in exchange for a tutoring session one day a week. Host a barter party. Invite children to come to the party with an item or items they would like to trade or index cards of services they can provide other children. During the party, children will be encouraged to barter for new goods and services. Make it clear at the beginning of the party that children will not get the items they brought returned to them, so they should bring something they are okay with getting rid of. 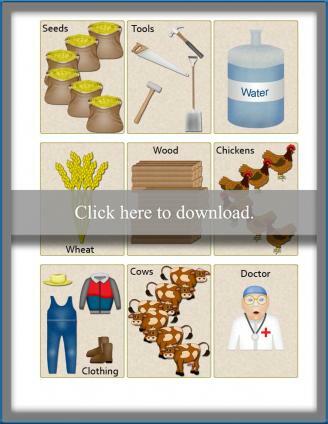 Play a game of Would You Survive, a printable card game where children barter to gain the supplies they need to meet their basic needs as settlers. At first, children may trade freely, but as they learn that items such as fuel are in short supply, they will learn about holding on to valuable items or increasing the value of a trade. The game is designed to be played with 4 to 8 players and will be best enjoyed by children in 3rd grade and up. If you need help downloading the printable, check out these helpful tips. The printable includes full instructions and everything you need to play. The objective of this lesson plan is to teach kids the basic concept behind a bartering system. Kids ages five and up can begin to understand what bartering is and how it works. The only materials you will need are a large writing area and several random objects. How did you get your pencil? Give students the chance to answer both questions by raising their hand. Write all the kids' answers to each question underneath the question. Explain the definition of bartering and describe examples from history and the present. Give each child one, two, or three of the random objects, making sure some kids have one, some have two, and some have three. Ask them to sit in a large circle. Choose a student to start and they can ask either the person to their left or the person to their right to trade objects. If the other person wants to trade, they exchange objects and the turn is over. If the other person does not want to trade the student keeps her object and her turn is over. The person to the first student's left goes next and gameplay continues in that direction until everyone has had a turn. Start from the beginning again and each student can ask any other student to trade. Ask students to take turns sharing why they decided to trade or not. Write these answers on the board. Ask students to vote by show of hands who ended up with the most valuable object(s). Why is this the most valuable and how did they get it? Write these answers on the board. Ask students to vote on who made the best trade. Why was this the best trade? Write these answers on the board. Open a discussion on what bartering is, who it can help, and why it might not be a good thing. Books, movies, and websites for kids feature a more comprehensive look at all aspects of bartering. Why reinvent the wheel when you can fill an entire educational unit on bartering with lesson plans created by other teachers and professionals? Scholastic's lesson "Bartering: An Early Form of Interdependence" goes through bartering in colonial times and illustrates some of the problems colonists faced with the system. Donut Dinero, from the National Teacher Training Institute, incorporates a video about bartering to help children understand the concept. The Federal Reserve Bank of Cleveland presents Escape from Barter Islands, a game where players have wrecked a ship and must find a way to trade oranges for a sail to help get back home. Teach children about bartering by having them do some bartering themselves. Visit a bartering website offer a good or service for trade, and then see what kind of response you get. Since this involves interacting with strangers, make sure children do not barter alone. Trade books with other readers on PaperBackSwap where the senders always pay the shipping fees. BarterQuest features items people have to trade and a section of items people want. Game Trading Zone is all about trading video games and you can set up an account for free. Bartering can serve as more than a history lesson for kids. By learning about bartering, kids can learn a tool for meeting their needs and getting items they want without spending a lot of money. They will also learn that items do not have to have a specific dollar value attached to them in order to be valuable.